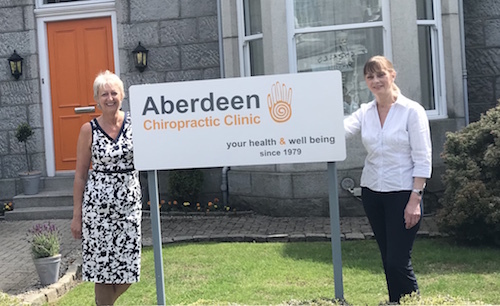 Susan (Manager, pictured left) and Avril (Chiropractic Assistant, pictured right) are exceptionally good at assisting the patients and the Chiropractors so that your visit to Aberdeen Chiropractic Clinic will be a comfortable experience valuing your time and needs. Susan and Avril travel with the chiropractors to conferences and seminars in the UK and around the world regularly. They receive special training preparing them to be clinic assistants and they all enjoy the buzz of the clinic and handle our very busy reception with great expertise. Our team at Aberdeen Chiropractic Clinic – including the staff and chiropractors – all have a great passion for chiropractic and we enjoy the fun atmosphere and variety in the days at the clinic. We hope that you will be inspired to improve your health and well being with us at your side. When you are ready just call our Aberdeen team.